When you have pets you know that their lives, although such a huge part of your own, will most likely come to an end . You might try to prepare yourself but when it happens it is still a really difficult thing. I will be honest. I cried most of the day on Friday. Chris was in Chicago for work, I was home after canceling my trip to Ohio because of the weather. I had enjoyed a few days at home doing a lot of reading and snuggling of cats. I am so glad I did. Friday morning I got up and went out, as is my routine, to make coffee and give the kitties treats. Holly came right up but there was no Buddy which was really unusual because he always was the first one to greet me. I looked around and called him and then saw him laying still in his bed. My heart sank. He had not been sick. As a matter of fact the day before he was racing around like a kitten and I commented to him (yes, I talk to my cats) that he was acting like a ninny. But something happened and it was his time. I touched him tentatively and he was still warm and I had hope but there was no rise and fall of his chest. He was only 11 1/2 and I had thought we would have him with us much longer. But I suspect that he had used up more lives than I had thought with his bout at 5 months with eating a string that wrapped around his intestines. And of course there was the whole chylothorax episode 7 years ago when we nursed him back to life when he was on death’s door. He was such a good cat. Always with me. Always on my lap when I was reading. That’s what I will miss the most. Pets have a way of getting under your skin. They become a part of the family and rational or not – they just become real. Buddy was real. 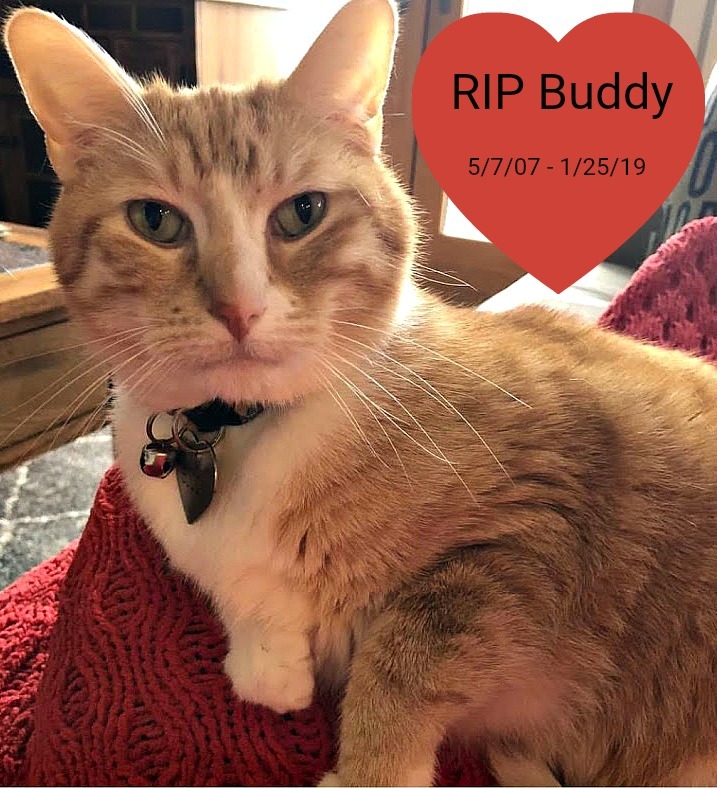 Buddy was real to his favorite cat sitters –Kayla, Jeni and Allie have all loved and taken care of Buddy and Holly over the years. 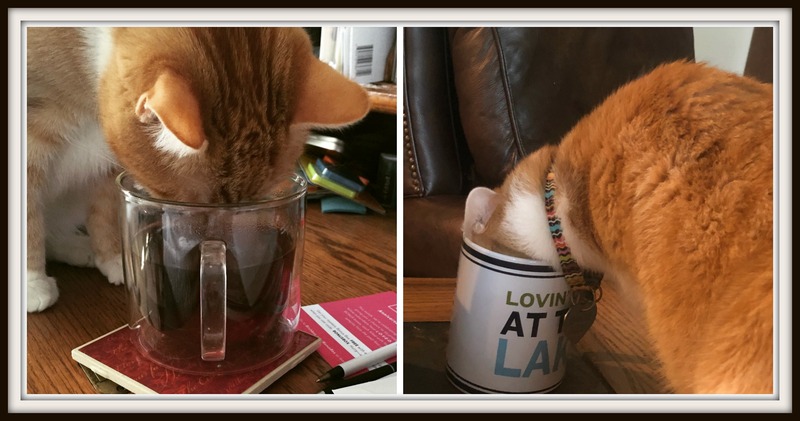 He loved to drink my tea –he was truly my cat. Buddy brought comfort to many others as well including Chris’s dad who kept Buddy and Holly while we lived in Australia. They were good friends and it was Chris’s dad that was reluctant to return them to us when we came back to the states. They also lived with Aaron for a while when we were moving from Iowa to North Carolina and Aaron was a big part of his life since he had picked him out originally. I knew I wanted a boy and girl cat when we moved to Iowa and since there was only one girl kitten that was easy. Buddy was picked out from three baby boy kitties. So now we have one. Holly has such a different personality than Buddy. She has always been more aloof but now as the only cat she is just going to have to figure out that we need her as much as she needs us. She is a little lost since Friday but hopefully will assume her role as main cat and endure all the snuggles. Holly is still figuring out that her bed buddy is gone. If you have a pet please take a moment today to snuggle them a little bit closer, give them a treat and tell them that you love them. As for Buddy – he really was the best cat ever and will be so missed. ← Previous Need a Book Recommendation? Here Are a Few to Consider. Arizona, Ohio, Pennsylvania and Minnesota – What Do These States Have in Common? Sonia, thank you so very much for your sweet words and concern. I know I am silly about how much I share about my cats but they have brought me so much happiness over the years that it is hard to not share. Thank you so much for your sweet words. I’m sorry for your loss Beth. I know how hard it is to lose a pet. I imagine it’s worse when they seem perfectly healthy one day and surprisingly are simply gone the next. Take care of yourself and poor little Holly who’s probably got the biggest adjustment to make. Thank you so much, Christine. It was really a shock but I am so grateful that my plans had changed so that I was home during the week instead of being in Ohio. It made me realize that everything happens for a reason. Thank you so much for your sweet words. They mean a lot. I have been crying off and on since I heard this sad news. Our fur babies are so special. Dot has had extra cuddles today and an extra cookie. Sending mega hugs to you, Chris, Holly and everyone else who will miss this sweetie. Forever in your hearts. Oh Darlene, thank you so much for your sweet words and concern. 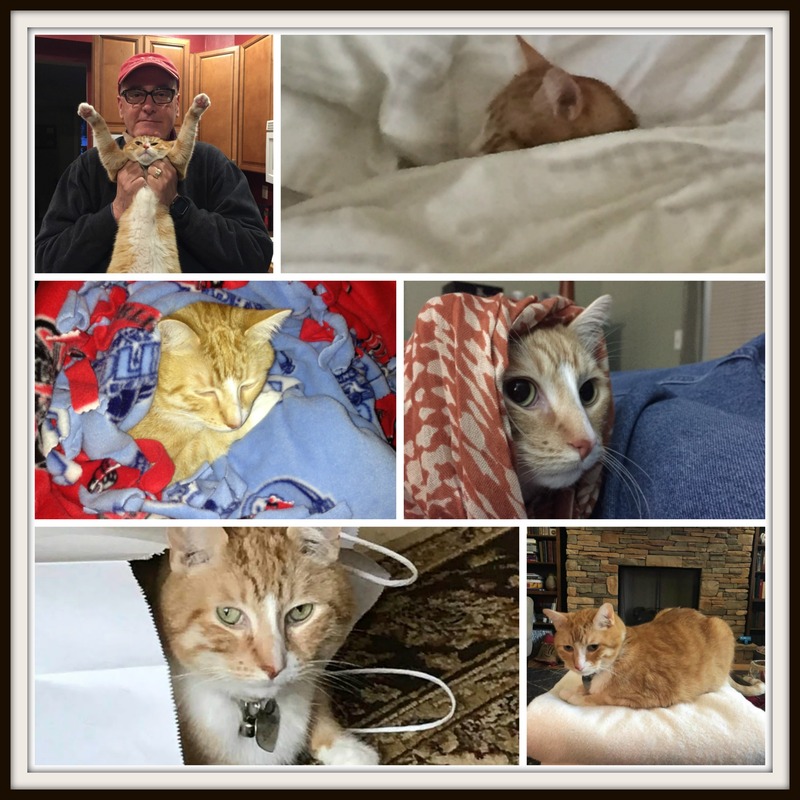 I know I plaster my cat love all over Facebook and my blog so it seemed the only way to deal with this loss to do a tribute. He really was a great cat. Thank you so much for the sweet words, kind thoughts and for snuggling your sweet Dot a little bit more. Love you! Oh my goodness. I know your heart and that loss. Our pets invade our hearts in such a mighty and deep way. There is no way to avoid the goodbye to a beloved pet and family member. But I think it helps to know that others know and understand and hurt with you. And Holly may surprise you! 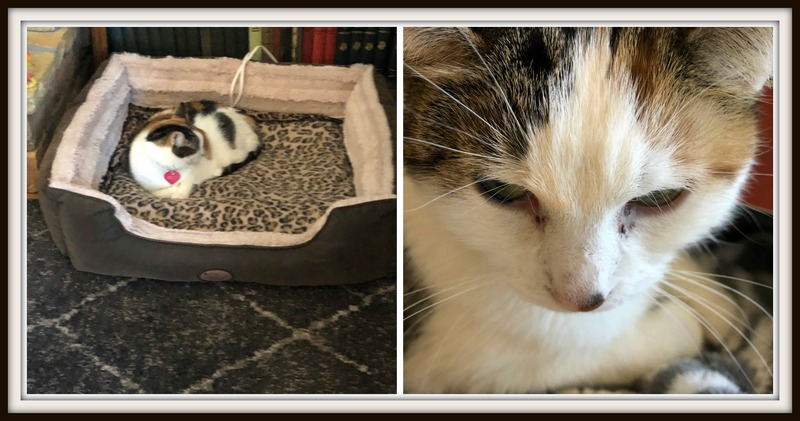 As we watched one black cat after another leave this world (at one time we had four of them), the others rallied and figured out how to help fill the gap for us. Even when we were down to one, he seemed to understand his new role as only cat and he did it well until his time, too, came. Hugging you. Thank you so much, Virginia. It has just been a tough few days and it helped to write it out, find pictures (there are more than a few) and just work through the shock. I love that you had 4 cats at one point —you who were not a cat lover were won over by the furry things. Thank you for your kind words and love felt across the miles. Oh Annette, thank you so very much for taking the time to read and leave a comment. It helps to write it all out so that is why I chose to share on my blog. I know that it will take awhile to get on with life without him and I am going to take time and cry when I need to. For some reason it helps. Thank you again so much for your kind words. Enjoy Florida! It has to be warmer than here. Oh, Beth Ann, I am so sorry. When I saw oon Facebook that your guy had passed I wept for you. This January has claimed so many fur babies for my friends. I feel for you. It”s been 8 months since we lost Rosie and I still break down. She was my girl and there is no filling that hole, no matter how many kisses and snuggles I get from Angus. Just know Buddy fit so much love into his short life, all because of you. Thank you so much, Miranda. There is a world of pet lovers out there who understand the depth of the loss and we all share when it happens to one of us. Thank you for sharing your sweet words. I truly appreciate them. I’m so sorry. RIP Buddy. And I’m so glad that you had cuddle time together before he crossed the rainbow bridge. I hope all your good stories, memories and pictures will help ease the pain. Oddly enough my Mom lost one of her Doberman’s last Tuesday the exact same way. Thank you so much, Katybeth. We have so many great memories and pictures to remember him which helps. I am sorry for your mom’s loss as well. The quote is lovely. Thank you. Awww Beth Ann. I’m so sorry. I’m glad you were home though, you would have felt terrible if it had happened while you were up north. I love the photo of the two cats snuggled together, heads together. Sort of in the shape of a heart. I agree. That is exactly what I thought and I think the timing was just how it was supposed to be. Plans change for the better sometimes and this was one of those times. Thank you for your kind words. And yes–that cat heart photo is one of my favorites. Thank you again. 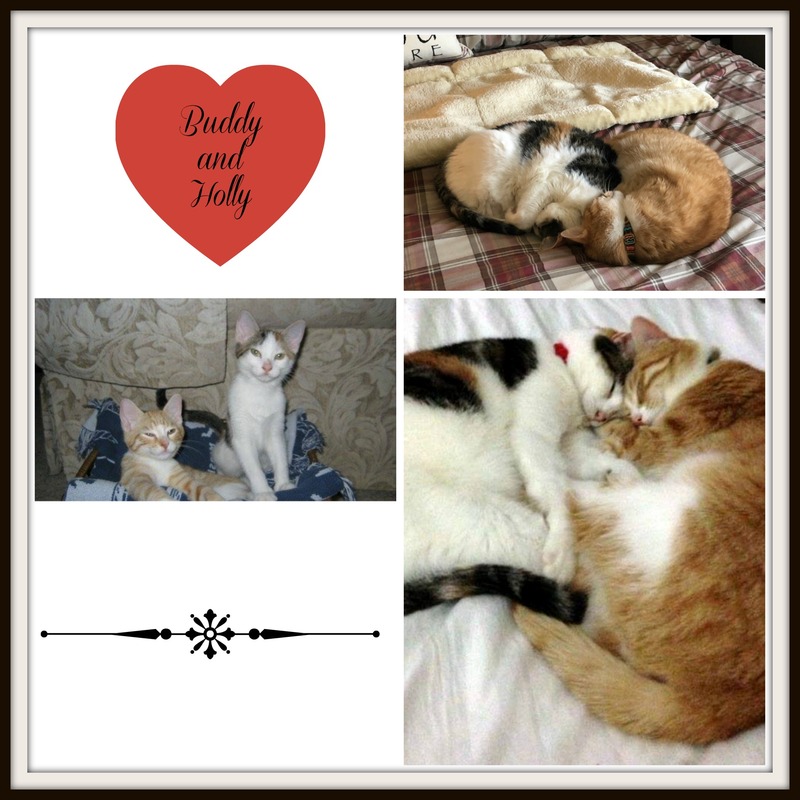 Buddy was a well-loved cat! Yes, he was. Definitely knew he was a part of the family. Your sweet Buddy passed away in his warm cozy bed. And he may have even heard you saying goodbye to him. 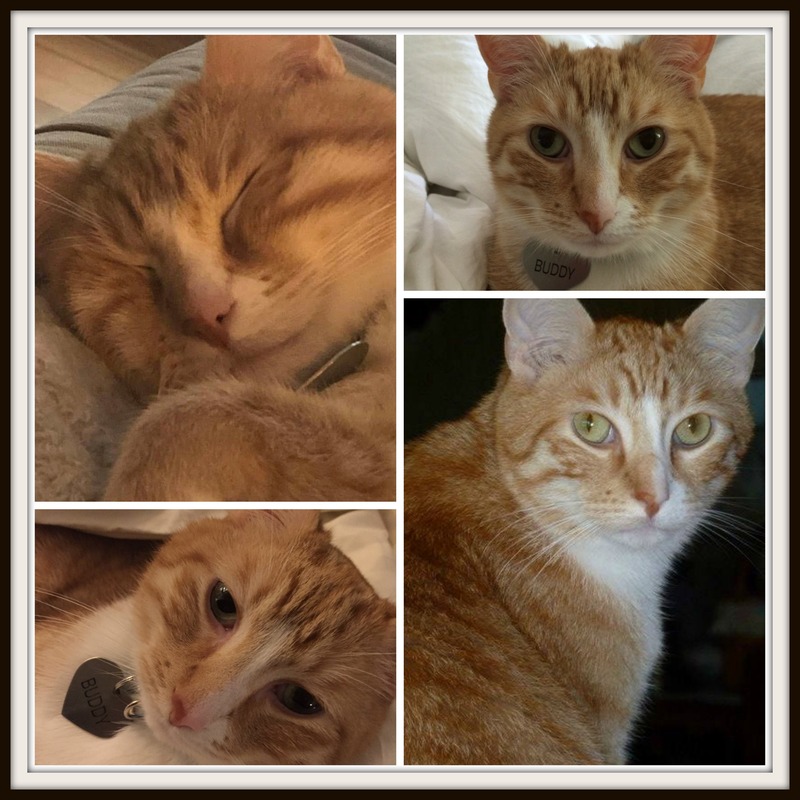 I’m glad you had the joy of Buddy- I loved seeing him in your posts- such a good-looking cat with personality. Thinking of your t this sad time. Blog about him all you want- we are all here ready to read and share it all with you. Still sending hugs and prayers. Glad you have so many pictured to look at! I have a few pictures, don’t I? 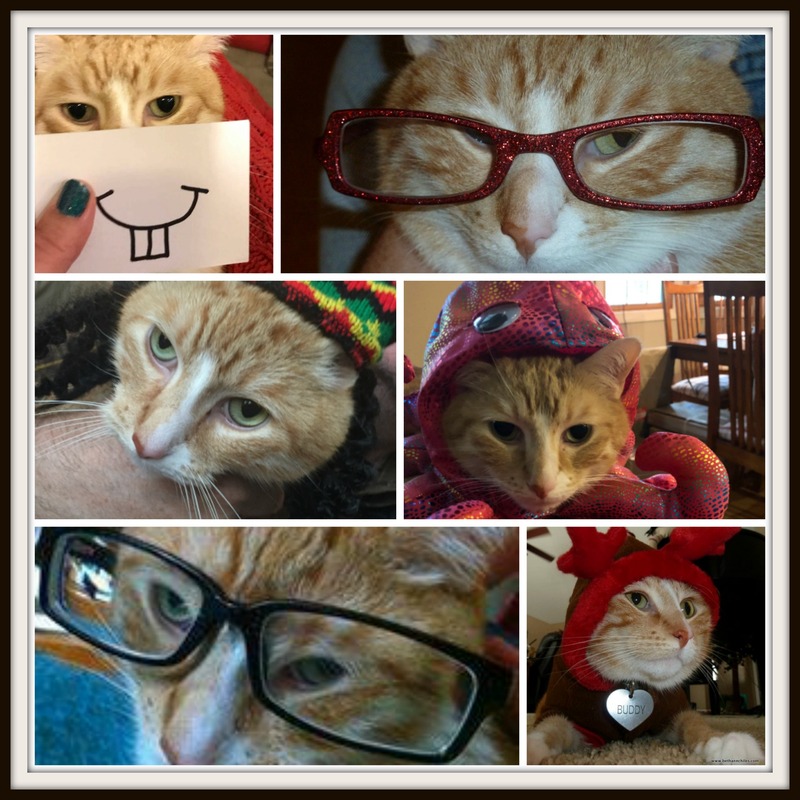 I am a silly cat picture taker that is for sure. Thanks for the hugs and prayers. Feeling them. I am so sorry for your loss. We haven’t had a pet for many years now because losing our dog and cat several years ago was as hard as losing a family member. The grief is so painful. I hope your heart will mend soon, and I hope Holly will be okay without her brother. Thanks, Tara. I know that a lot of people really do understand how these pets are just part of the family. I am so glad I had so many great years with him and that I was home when he passed. I would have felt horrible if I had been gone and my kitty sitter had found him. Thanks again. I know you must be hugging Holly a little tighter now with Buddy gone. It’s hard to lose a cherished pet. I cried over our Callie, who, like your Buddy, was the best cat ever. She was 13 and I truly doubt we will ever again have a kitty as wonderful as she was. I’m so sad for you. There are some kitties who are just special, aren’t there? Like your Callie. We have had 4 cats and Buddy has been the favorite by far. Thanks for your concern and love. Oh, Beth Ann, I am so very sorry! You know I know how you are feeling! Sending hugs! Thank you so much. I know you understand. Feeling some better today but it is so quiet here without him. Hard to imagine that losing one cat would leave such a void but it is very quiet and sad without him. I am so sorry, dear friend. So sorry. And I am thankful weather caused that cancellation of your trip to Ohio. You were meant to be home, to be with Buddy. I agree- I was right where I was supposed to be. We had some nice snuggles that week. What a great tribute to Buddy! It’s amazing how much pets become part of our family. Prayers for comfort and snuggles from Holly! They absolutely know! Pats to Finn! I’m so sorry we lost buddy. It seems too early – I feel more at peace knowing he went in peace in his home surrounded by his family. He brought me so much joy .I have my mug with him and Holly at my desk every day. I feel Buddy’s love. You were a huge part of his life. I feel like it was just his time and I don’t think he suffered at all. He will always be in our hearts. Love you.